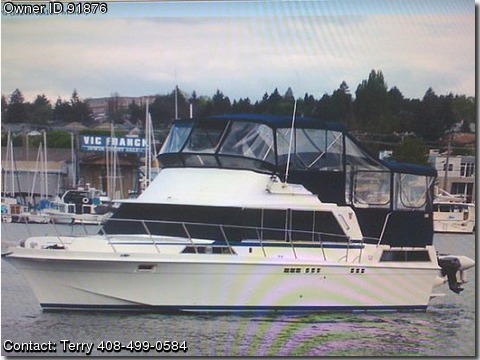 Call Boat Owner Terry 408-499-0584. Uniflite 36 foot Tri Cabin Motor Yacht Super clean 1975 Tri cabin motor yacht. Kept in fresh water, covered slip, washed monthly. Waxed every year. $130,000 in improvements. New tinted windows and tracks and stainless housing. New never used canvas to cover windows. New never used aft railing canvas. All teak interiors are perfect. Gray green rug with whole throw rugs. New fuel tanks and all associated hoses and connections. Remove and update both 454 300 hp engines. New house battery system and chargers x 3. 6.5 gen set painted and tuned. New holding tank 50 gal with all new hoses and gauges. Microwave, toaster, stove, blender, coffee maker. Dinghy 9.9 with 9.9 Evinrude. New dinghy rigger and winch. New 110 plugs main deck. All kitchen supplies and more. New teak bar at main station with bar stools. Sony stereo in forward cabin. Boise stereo speakers with apple hookups. Sleeps eight and can sleep 12. Gps on IBM lap top and navigation maps by Tiki Navigator. New anchor chain and line. New under water blue/ white lights aft. New step system onto boat. Black counter tops with black matching mini blinds throughout. Four new sleeping bags and extra blankets and linens. New teak doors with tinted windows. New fender holders with CRT set. Six new life vest and. Video cameras Aft and engine room.